Our humans took some time out last weekend to pick apples growing from the apple tree in our backyard. Since we pigs happened to be munching grass nearby they nabbed us for a few snapshots with the harvest. Some of us (namely Abby-Roo) were confused by the sudden change of scenery. However, it didn't take long for the more enterprising among us to realize that we were sitting amid a pile of ripe, juicy apples. 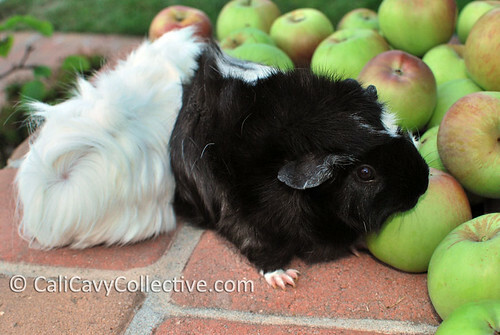 Since apples are relatively high in sugar for guinea pigs, our humans only give us small slices as treats. 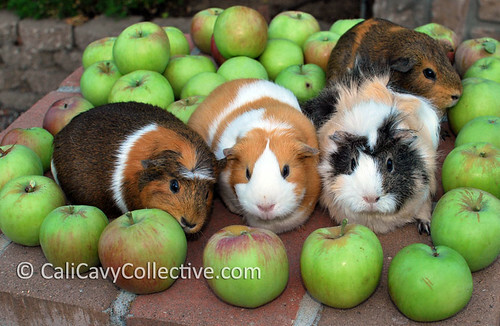 It came as no surprise that Truffle and Peaches were especially intrigued by the concept of an apple in its entirety. Investigative sniffing and aggressive nudging of said apples ensued. Of course, sweet toothed Revy wasted no time sinking her teeth into the fruit once she realized what was in front of her. She managed to wolf down a good sized chunk of the apple before our humans managed to pry it away from her. One apple down... many more to go. Excellent photos - I love the pigs all ringed with apples. So many apples, ao little time. My sow horrors dislike apple and tend to give me Badger-style death stares when given a piece. The boars eat anything, Woody in particular will wolf food down as though he has not been fed for days. Seems that boars and boys have that in common. Except men never get as enthused about being presented with a plate of lettuce for dinner. Oh, I love this set of pictures. So cute!